Dynamic range in photography is the difference between the brightest and darkest part of a scene that a camera sensor can capture. Let's keep it simple silly as the whole purpose of this post is beginner focused. The dynamic range of a given camera sensor becomes important when the photo has a major difference between the dark and bright parts. Example: A room with a window during the daytime. When trying to take an indoor space shot, it would be super hard for the camera to capture everything in one shot. Digital cameras don't see the way human eyes do. Due to this limitation, the indoor will appear to be very dark when the exposure settings are dialled for the window. Try dialling the settings for indoor exposure, this time windows will get overexposed and turn white. In order to solve this problem and produce a photo with maximum details, HDR photography technique is needed. The process of taking or producing HDR images is called HDR photography. An HDR image typically consists of 3 (or even more) images. HDR photography allows a user to see both darkest and brightest part of a given scene in the final image. In HDR photography, a user takes multiple shots (3 or 5 or 7) of the same scene by adjusting the exposure value. Most of the DSLR cameras allow automatic exposure bracketing which performs automatic changing of camera settings in between shots. Here is my previous in-depth post about how to do automatic exposure bracketing. Few smartphone and DSLR cameras process HDR images on the fly these days which is an extremely smart way of doing it. This technique is often referred to as in-camera HDR. -Real Estate. A major application of HDR photography. 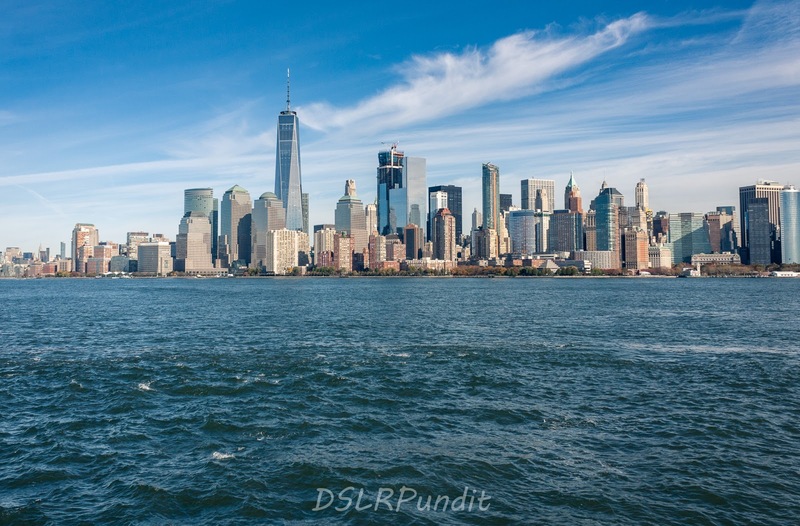 How to do HDR in Adobe Lightroom Classic CC? Step 1: Take automatic bracketed shots without moving your camera, a tripod helps a lot. The GIF animation below shows an example of 5 brackets shots using my Canon T5i camera. Step 2: Import/Copy images to a computer. 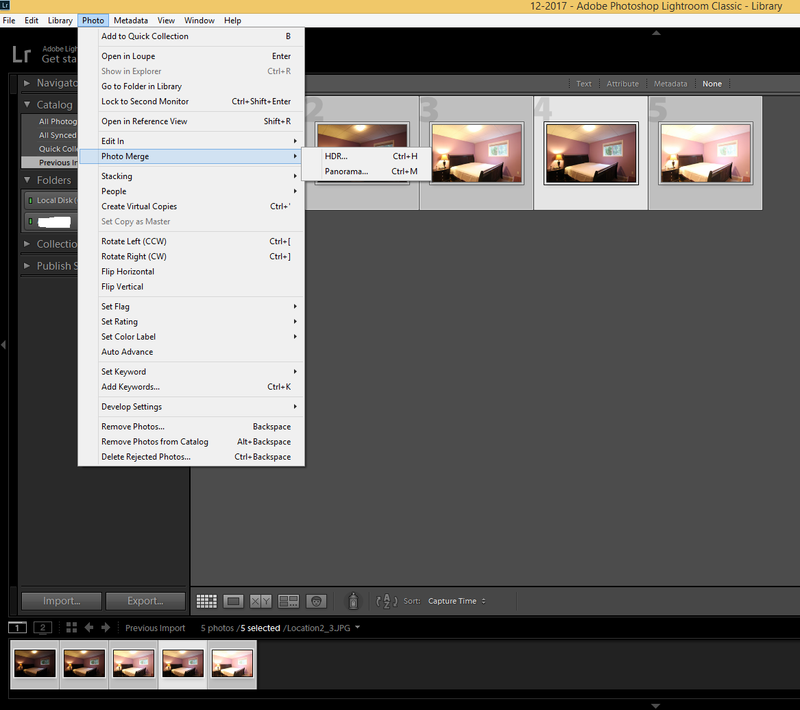 Step 3: Launch Lightroom and import photos in Lightroom. Steps 4: Select all photos and go to Photo dropdown -> Photo Merge -> HDR. See screenshot below. 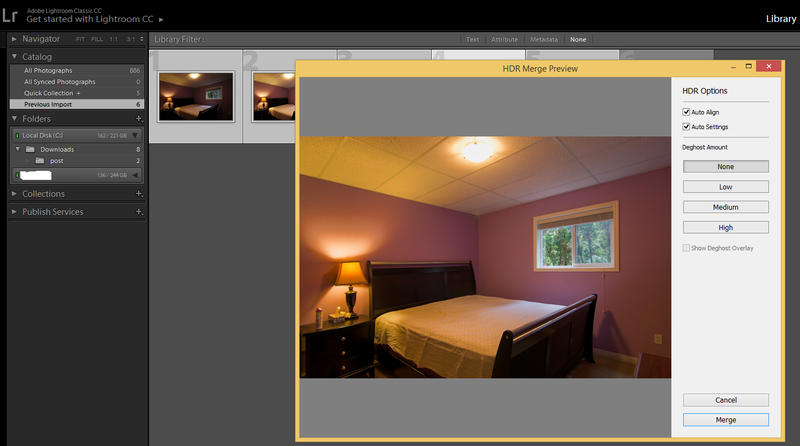 Step 5: In the HDR Merge Preview window, select auto align to make sure all the selected images are aligned properly. If you notice a few unnatural transparent areas in the image preview, select the deghost amount value to low. Always start with low and adjust accordingly to achieve the best results. Above screenshot shows the final preview of what the output would look like based on the images and settings selected. Honestly, I like the Lightroom HDR tool quite a lot for its ease of usage and simplicity. This is a very common and often misunderstood topic of discussion when it comes to HDR photography. What photographers actually don't like is poorly edited HDR images with oversaturated colours and nasty fringing. The strong abomination for HDR over the internet is present because a fair amount of those HDR images have strange colour casts. But why do consumers appear to be okay with any sort of HDR? Is it because photographers are critical about everyone's work including themselves? The second reason does hold true to some extent. Also, professional photographers view tons of images and their livelihood revolves around images whereas consumers get to see far fewer images. So there is a big possibility for them to look at an unnatural looking HDR photo and say "wow" instead of "no". Hope this guide helped you understand the basics of HDR photography and how to create HDR photos in Lightroom. Share the photography love by sharing this post.